We meet at 7:30 pm at the Lexington of Jackson Hole for a pre-trip meeting. This is an opportunity to meet your fellow travelers and guides, and ask any last-minute questions. Your guides will give you a thorough trip orientation, and pass out your waterproof bag so you can pack your belongings that evening. After an early departure from Jackson, we begin the first day of our adventure in Yellowstone National Park with a visit to Old Faithful, the world’s most renowned geyser. We’ll view its regularly occurring eruption and then meander along the extensive boardwalks that highlight the otherworldly geothermal features in the area, often sharing the experience with a stray bison from a nearby herd. Following a delicious lunch, we continue further into Yellowstone National Park, where we make exploratory stops along the way, which may include the Lower Geyser Basin and the Fountain Paint Pots. We then make our way to a campground in Madison or West Yellowstone, pitching our tents amidst the pines and enjoying a welcome dinner prepared by your guides. After breakfast we venture to the Norris Geyser Basin and further into the heart of Yellowstone National Park. Near lunch time we’ll arrive at the Grand Canyon of the Yellowstone River, taking in the awesome power of the Upper and Lower Falls. Artist Point is must-see view—be sure to keep your camera or sketchpad handy! From the Canyon we’ll drive south to Yellowstone Lake, the largest high alpine lake in North America. Our final destination is Grant Village or Bridge Bay, were we’ll check into our campground for the night. The late afternoon is free for you to explore the grounds, reconvening for dinner as the sun sets behind the mountains. In the morning we’ll be on our way to Grand Teton National Park. We’ll launch our kayaks from the Signal Mountain Boat Ramp and head out across the lake toward our camp on Grassy Island, located in Moran Bay. We’ll stop for a picnic lunch en-route, excited to arrive at our secluded island camp, which will be our home for the night. We’ll keep our eyes open for moose, elk, fox, beaver, black bear, mule deer and coyote that are found in the area. We wake with breakfast and a morning hike to Leigh Lake. Now that we have conditioned sea legs we depart our Grassy Island camp and paddle to Spalding Bay. En route, we will stop for lunch along the southern shore of Jackson Lake and take in the majestic view of the Tetons. Spalding Bay camp is spectacular, and will be our destination for a delicious dinner and a night under the stars. The first two nights will be spent camping within Yellowstone National Park and in West Yellowstone. The final two nights of the trip will be spent camping on Grassy Island, or along the lakeshore of Jackson Lake at Coulter Camp or Spalding Bay in Grand Tetons National Park. After an active day of paddling or hiking and exploring, we prepare to camp for the night. Upon arrival, our first task is to unload the vans or the boat (depending on where we are camping) using a fire line of crew and passengers to expedite the process. Individuals then collect their waterproof bags and locate an area on the beach to camp for the night. On the first night in camp, a crew member will give a demonstration on setting up a tent, which you’ll see is quick and easy. The guides will set up the kitchen and central dining/seating area with camp chairs. They will also locate a secluded area away from camp to set up the portable toilet, where privacy is assured. At the pre-trip meeting each person will be given one large waterproof bag (approximate sealed size: 29” tall x 33” diameter). Tents and sleeping pads will be stored separately. Please note: If you rent our gear it will come already packed in your issued waterproof bag. Your remaining gear, therefore, must also fit in that one bag. We also provide a small waterproof bag for day use where you can keep items such as raingear, camera, sunscreen, lip balm, etc. (17” tall x 9” diameter―approximate sealed size). The bags are cylinder in shape and pack from the top. Please pack light, and keep in mind that river attire is casual: comfort, convenience and boat space take precedence over style. 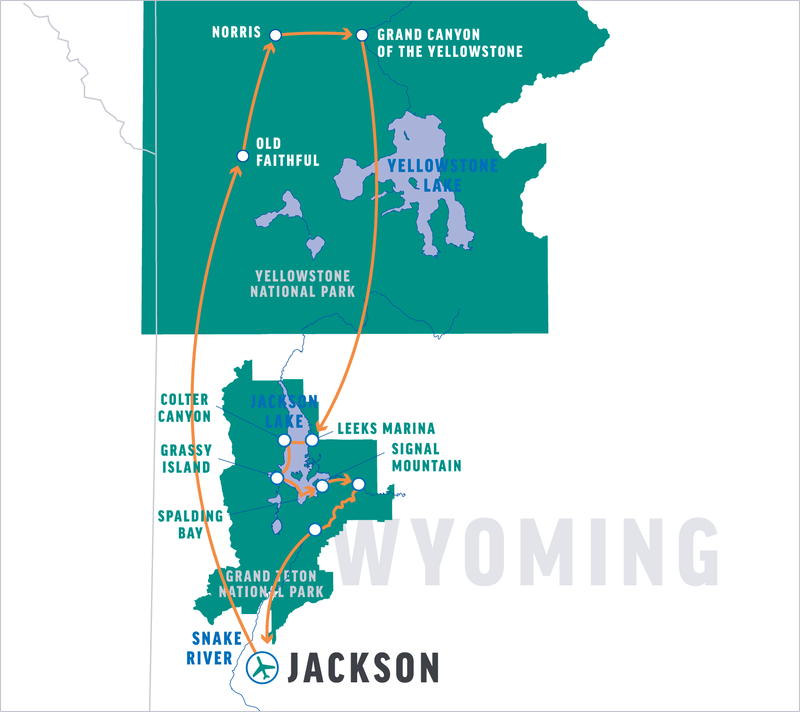 At the end of the trip, you will return to The Lexington at Jackson Hole with your waterproof bag, where you will be able to unpack your gear before your trip home.